I love Gary Vaynerchuk. I've been his #1 fan for almost 10 years. In many of his videos he mentions buying NY Jets so I created this funny website that tells you if Gary Vee has bought NY Jets yet. If you don't know who Gary is or why he wants to buy NY Jets then watch this video. 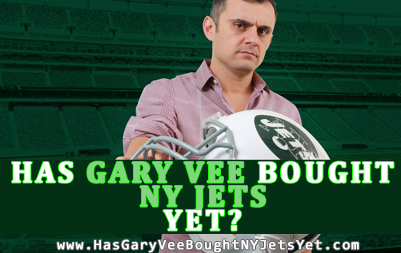 Why Gary Vaynerchuk wants to buy the NY Jets? Now go and watch all his other videos and until next time!